The sophisticated resort town of Punta Del Este, offering world-class cuisine, designer boutiques, and a spectacular night life is 20 minutes by car from Sugar Loaf. This is the place to see and be seen for the upper class of Uruguay and, even moreso, Argentina. On the outskirts of Punta del Este is one of the most spectacular views in Uruguay, Punta Ballena. From here, looking east, you can see Punta del Este; looking west, the beach of Punta Ballena lined with million-dollar homes; and Sugar Loaf in the background. The scenic overlook and the park at the end of Punta Ballena are not to be missed. 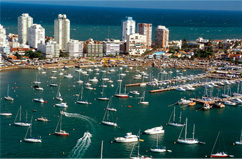 Arriving in Punta del Este, on the right-hand side, are some of the beautiful beaches the town is famous for. On the left, you’ll see the most exclusive hotel in South America, the Conrad, with its grand casino and nightly shows. The Conrad is the place for international entertainment. This year, during the off season, Liza Minnelli and Frank Sinatra Jr. were performing. During the high-season, the world’s current headliners can be seen, like Ricky Martin and Shakira. 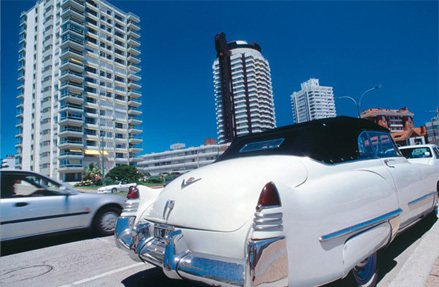 Punta del Este is South America’s Miami. In fact parts of the movie Miami Vice were shot here, so close are the similarities between the two towns.